I first heard the music of Russian composer and electronic musician Edward Artemiev nearly 10 years ago, when I was sent a batch of CDs from the Electroshock Records label, run by Edward's son Artemiy, also a fine composer and musician. I had actually been introduced to Artemiev much earlier, though I had been unaware of it, when I saw Solaris, the popular science fiction film directed by Andrei Tarkovsky. Artemiev creates both challenging experimental music and beautifully symphonic works. And in addition to Solaris he has scored the soundtracks to many films in Russia, as well as the American TV movie, The Odyssey. 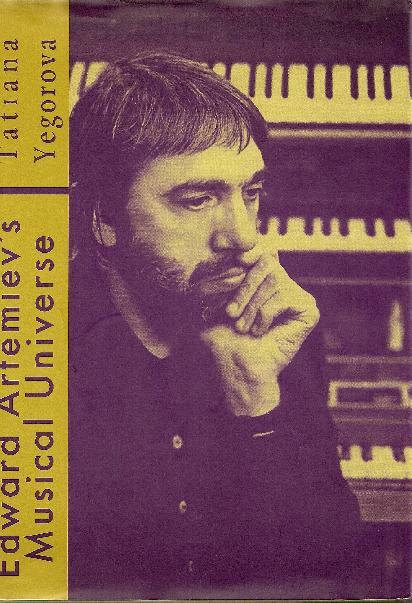 In Edward Artemiev's Musical Universe, Tatiana Yegorova tells Edward Artemiev's story, an artist she considers to be the founder of Russian electronic music. The book is both biography and detailed analysis of Artemiev's work. Born November 30, 1937, Artemiev came of age as an artist in the Khrushchev and Brezhnev years. Characterized by both post-Stalinist "thaw" and later stagnation, Artemiev's experience in this era is representative of what many Russian artists experienced as they struggled to express themselves. Yegorova points out that most works about Artemiev have focused on either his film work or electronic music. And the author's stated intention is, to combine the two key components of Artemiev's creativity into a single wholesome entity, and while studying the life of the composer and his musical pieces, try and produce a multidimensional portrait of a musician who is perceptive both to new discoveries in contemporary art, and is able to delicately preserve the classical heritage of the previous generations. We learn how as a young man Artemiev's uncle was the first to notice his talents. He received a good education and encouragement while enrolled in a 10 year course at the Choir School for boys, and after that enrolled in the department of theory and composition at the Moscow State Conservatoire. Yegorova goes into detail about the conflicting nature of Russian culture at this time, struggling with cracking open the iron curtain to Western countries, exposing Russian artists to this new world, yet censorship remained and much was still closed to the public. Yegorova describes life for Artemiev at the Conservatory, some of his experiences being typical of any student in higher education struggling with pressures to conform (sometimes a necessity to secure stipends) vs. following their own muse. She also discusses the compositions he submitted in this period, and opposition that he, and other students, faced from professors in the department of composition, particularly political-ideological obstacles they had to contend with. Intolerance of some of the Conservatory professors to the growing dissent of some students was followed by repercussions against the disobedient and demonstrations of a rigid and dogmatic stand with regard to new trends in the composition techniques of the second half of the 20th century. At the same time, there were progressive minded people at the Conservatory with advanced views on art, and differences in views would actually lead to internal conflicts within the Conservatory. Chapter III is where the book starts to get especially interesting. Yegorova gives a good history of the ANS synthesizer and the development of electronic music in Russia, and we learn how the peculiarities of Russian-Soviet politics and culture left an opening for artists interested in electronic music. In the 1950s and 60s party bureaucrats went on a cultural crusade against what they called "trends generated by the agonizing capitalist system." Electronic music, however, seem to be somewhat spared, "since there were no normal conditions whatsoever in Russia for its development, and the minimum that had been created by the efforts of some enthusiasts happened to fall out of the focus of attention of the bureaucrats in the artistic sphere. Carried away by the struggle with postmodernism, at a certain moment they just lost sight of electronic music, which made it possible to first organize a laboratory, and later, in 1967 an Electronic Music Studio on the premises of the museum-apartment of A. Skriabin. However, this proved to have its own set of challenges, because, as Yegorova explains, electronic music was denied the right to be regarded as art, which had a negative effect on its development. Yegorova goes into detail to describe the opportunities that lead to the many film scores Artemiev would compose, as well as theater work that brought him attention. Also, and among some of the more enlightening parts of the story, are the descriptions of Artemiev's experiments with new compositional techniques - his work with sound, magnetic tape and electronic equipment. Another interesting milestone is what Yegorova describes as Artemiev's pivotal discovery of pop music in 1969. And by "pop music" she is referring to such music as King Crimson, Klaus Schulze, Ash Ra Tempel, Tangerine Dream, Kraftwerk, Pink Floyd, Emerson Lake & Palmer, and Vangelis. And recalling the recordings I have from the Electroshock label its clear how the influence of Rock music and the Progressive rock of the late 60s and early 70s has impacted his work. Over 40 years Edward Artemiev has score approximately 150 films and worked with a variety of directors, though globally he is probably best known for his work with Tarkovsky. He also wrote the opening and closing ceremony music for the 1980 Olympic Games in Moscow, which seems quite an achievement given Yegorova's insistence that he is relatively unknown in his own country. I was surprised to read that Artemiev is better known around the world (he is an honorary citizen of Baltimore, Maryland) then he is in Russia. Unfortunately, the electronic composition 'The Three View of the Revolution' by Edward Artemiev that gained wide popularity and was frequently performed in the West, remained quite unaccountably in oblivion in the composer's Motherland and was a terra incognita for the audience. That actually meant that, on the one hand, both the authorities and the heads of the Composers' Union, and the critics would unconditionally recognize him as one of the best composers of the Soviet Union, and on the other would keep demonstrating their absolute indifference to his work, which with the passing years was becoming more diverse and profound with regard to the creative concept, and the original electroacoustic means of expression. In 1999, he was awarded an honorary title of the People's Artist of the Russian Federation, was granted the title of the laureate of the OPTIMA prize (The Art of Unificiation of a Human Being and Information), got three Nike cinema awards in the best music nomination, and, finally, at the opening of the XXIII Moscow International Cinema Festival he was awarded for the first time in history of the MICF he prize of Saint George for the significant contribution to the world cinematograph. Much of the later part of the book finds Yegorova steeped in detailed analysis of Artemiev's work, which the reader interested in biography and cultural history might find tiresome. Case in point is the final chapter of the book, The Opera, which details this recently released 2-CD set, an ambitious Artemiev work based on Fyodor Dostoyevsky's novel Crime and Punishment. Still, I found the book to be a fascinating read, and easily skimmed over the academic analysis to get back to the biographical and cultural historical parts of the story. Edward Artemiev's Musical Universe can be ordered from Electroshock Records.